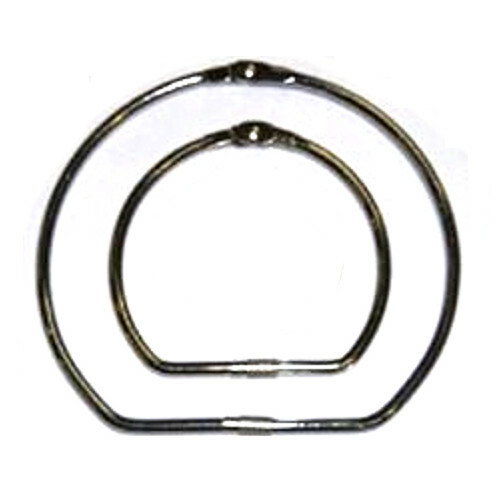 Screw lock rings, or Large Swatch rings are available in sizes 3" through 10". Screw lock rings, sometimes called King Size Rings are typically used to bind carpet or rug samples, upholstery sample materials, floor covering samples, and a myriad of other types of swatches or sample offerings. Screw locking rings are commonly used to create point of purchase displays and lots of other display items that require the function of being able to rotate around a ring in their presentation. Similar to loose leaf rings, Screw lock rings allow the bound items to turn 360 degrees. They are conveniently shaped in a "D" formation allowing the bound items to all remain aligned when all set along the straight side of the "D”. A screw lock on the flat portion of the "D" both provides security from unexpected opening and convenience through the ability to update easily. All of our screw lock rings are sold in packages of 10. The hole for the ring should be 1/4" in order for the ring to fit into it properly. This will not allow the hinged part to fit through the hole but it will fit over the screw lock part. Please call us with any questions before placing your order.